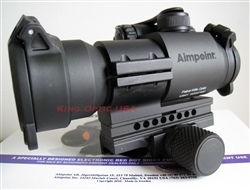 Patrol Rifle Optic - 3 year battery life, flip covers, QRP2 Rail Grabber modular mount, fast, accurate, Aimpoint tough. 30mm tube, 2 MOA dot, fully waterproof. 4NVD & 6 daylight settings. Unlimited eye relief. Spacer for AR15/M4 carbine applications. In-service date & battery change date reminder. Transparent rear flip cover. Battery included.